“The World Economy is Saved!!! Last week we speculated in Part 1 that the central banks, IMF, World Bank, world powers or someone out there had a plan to inject trillions into the world economy by the revaluation of numerous currencies using a new methodology of estimating the resources of a nation to value the currency. It appears that America and other European countries have been hedging their bets by investing in some of these currencies. If there was a large revaluation, this would certainly go a long way toward plugging the holes in our debt ridden ships of state. This could mean the addition of trillions of dollars and because of fractional banking, $10 trillion could easily be multiplied into $100 trillion. This week we are going to examine the potential results of such a huge infusion of capital. It may help in the short run but what about the long run? It would greatly help economies from America and Europe to China. It could mean a reprieve for the PIIGS (Portugal, Italy, Ireland, Greece and Spain), a way for the Obama administration to carry out his health reform and other spending plans without going deep into debt. There could be several million private citizens in various countries who may become overnight millionaires. It would seem like the lottery for those who gambled years ago that this would happen. I received emails from readers who were hopeful but had given up. If this currency adjustment takes place, I don’t know how much currency (such as Vietnamese Dong and Iraqi Dinar) is privately held and how much is held by the United States, Canada or any other governments. I doubt that information is available but it is a significant amount. Shortly after the first Gulf War, I personally witnessed the damage that Iraq had inflicted upon the Kuwaiti citizens. I was involved in their reconstruction and am quite familiar with their revaluation. Once Saddam “conquered” Kuwait, the IMF completely shut down the Kuwaiti Dinar because Saddam had looted vast quantities of the currency. It was not until he was driven out by force from Kuwait and thereafter, was the Kuwaiti Dinar given its former credibility and then some. Iraq once had a highly valuable currency but for the past 20 years it has been worth practically nothing. Yet, it has valuable natural resources. So let’s assume for a moment that some people get a windfall. A few quit their jobs (helping unemployment). Some go out and buy cars, houses and stuff. Uncle Sam and the States take their bite – a nice little windfall in taxes. And of course, the US government gradually cashes in their stash through oil swap agreements. None of these little deals are well known and are probably impossible to verify, so I am only going to speculate. There are some things we will be able to verify. We will know when currencies revalue and how much. If they do, there will be many trillions of dollars dumped into the global financial system in a short period of time. Will that help? Of course, the Obama administration can think of ways to spend lots of money and so can the Europeans. But what is the long term effect of having more money in circulation? At one time the Spanish were extremely wealthy as they stripped the new found colonies of their wealth – gold and silver. They were so successful and bought so much stuff from the rest of Europe, they ended up bankrupting themselves. Water may be necessary for life but too much will drown you. Too much wealth in circulation results in the devaluation of that wealth and can kill an economy. If we live on an island and produce so much and have a million dollars to buy stuff with and then, all of a sudden, the local bank decides it can make more if it prints three times the amount of money. The GDP remains the same but the money supply triples. What happens? The cost of everything goes up. The egg didn’t increase in value. It is still just an egg. But the money supply tripled and so the price of an egg tripled. This isn’t to say there is a one to one relationship. It is more complicated but that is the principle. Inflation is caused by an increasing money supply. That is what is causing the problem and it is the biggest tax you will ever pay. The house my parents bought new in 1946 for $10,000 in LA is not really worth $300,000 today. It is still a 960 square foot, three bedroom, one bath house. The house isn’t “worth” more because it is bigger, better or newer. The dollar is worth less. Anything that causes the money supply to increase causes inflation. Inflation is not the cost of goods going up but the value of the currency going down. I have written many articles on the Federal Reserve System, fractional banking, fiat currency, statistics and government lies. Money is created out of whole cloth (literally – see The Creature from Jekyll Island). Once a loan is made, the money is increased ten or more times. The Federal Reserve loans money to banks for next to nothing and the banks multiply it and loan even more. The Fed dropped an extra two trillion dollars into the economy the past two years and they call it Quantitative Easing. They increase bank reserves by purchasing bad assets, bonds or whatever the banks can’t handle. The Government Accounting Office audited the Federal Reserve for the first time in its existence and found that it loaned banks around the world $16 trillion to bail them out ($11T to USA banks and $5T to foreign banks). Let’s talk about debt for a minute. The government, the individual American, every company, government entity and country in the world is awash in a sea of debt. 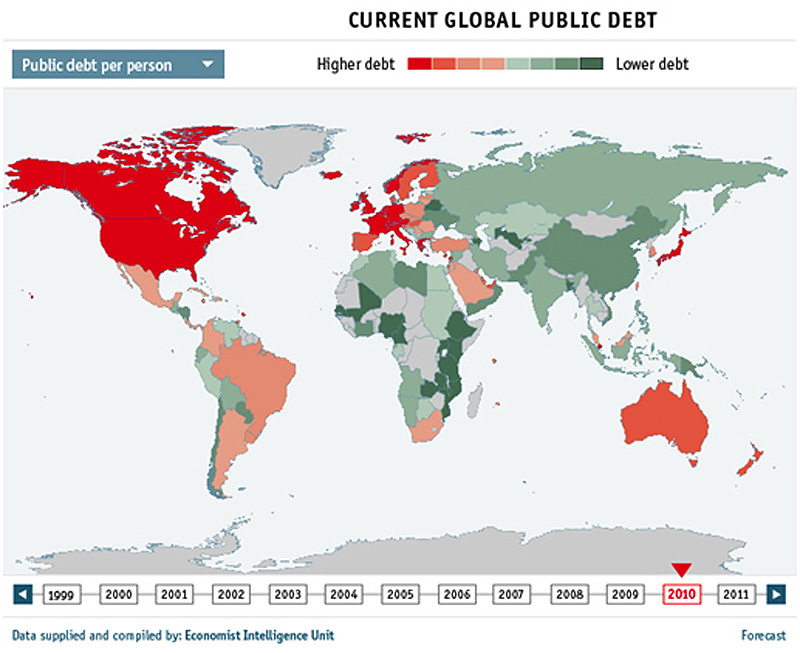 In America alone there is debt everywhere. The “national” debt that we as taxpayers owe just went over $15 trillion. Twenty five years ago, it was only $2.5 trillion. Unfunded liabilities represents money we owe and are committed to including Social Security, Medicare, Federal Pensions, Military benefits, etc. is $61.6 trillion. Some peg the total US debt at $100 trillion, more than 6 times our GDP! Student loans now surpass credit card debt – over $2 trillion! Home mortgage and credit card debt is huge – now over $14 trillion! How about business debt, state, city and county debt? Again, it is in the trillions! We could go on and on and on. This is many times our GDP. Does it matter? You bet it does. Now we go on to another type of debt, the type that brought down banks and investment houses in 2008 – derivatives. Let’s put it in simple terms. They package debt, whether mortgages, student loans or government bonds, get it rated high by a rating agency and then sell and resell and resell it to investors. They can leverage the value by 20, 40 or even 100 times. If the instrument fails, all debts have to be paid off and the whole string comes unraveled. This is what happened to Lehman Brothers, and recently to MF Global. One would think we learned our lesson but instead worldwide derivative exposure is $1.2 Quadrillion. Surely we learned our lesson after the 2008 meltdown. No, banks increased total outstanding derivatives by a record $107 Trillion in 6 Months! This is the outstanding derivatives reported by the world’s financial institutions to the BIS for its semi-annual OTC derivatives report titled “OTC derivatives market activity in the first half of 2011.” This is the stuff that the Euro debt is made of! The GDP of the US is $16 trillion and the entire world GDP is $60 trillion! There isn’t enough money in the world to cover this exposure. Banks and governments are gambling with our money and they keep bailing themselves out at our expense! We are drowning in a global sea of debt. More cash coming from a massive revaluation of world currencies will only spur the government spenders on and on adding more fuel to the fire. Increasing the global liquidity will only hasten more spending and more debt. There isn’t enough money in the world to cover this sea of debt. I only gave the U.S. side, but every country in the world is the same. The tendency of governments is to spend more than they have, to print money until it is worthless. If the government leaders understood and had the discipline, they would let banks and businesses fail. They would let the debt work its way out. They would lower taxes, encourage private sector business growth, but they won’t. The people cry for cake and cake they will get! They won’t settle for less. The truth is, it is so far out of control, it is just a matter of time and none of us know the rate or the date or the time. History can turn on a dime and the world we thought was so secure today is chaos tomorrow. Some years ago I was meeting with the Minister of Health of El Salvador and pointed out that the $27 million they received from us for their health programs was a loan not a grant. They were spending it on their civil war. Didn’t he care that some day it would have to be paid back? Why should he? He would be long gone. Unfortunately, this is the attitude of politicians. Keep the constituents happy by giving them more, inflating the currency giving the appearance of greater wealth while paying off the debt with cheaper dollars. It is all an illusion. The global economic system is doomed and for those of us who are Christians and know the Lord and Bible prophecy, this shouldn’t be a surprise. We know the system will fail and there will be a one world government under a wonderful appearing super charismatic leader we refer to as the “antichrist.” Ultimately the financial system will completely implode and it will be replaced by what the Bible calls the “mark of the beast” which a person must have in order to buy or sell. I illustrate this in a free e-book novel called Gideon’s Chronicles. For the dozens of people who so hopefully emailed me about their RV hopes, remember, “to whom much is given, much will be required.” (Luke 12:48) What is our life here all about? Our fleeting life or eternity? We can at least give all to Him who gave His all for us. Those who seek total control will be controlled totally. Those who seek to live and promote freedom will be free to live and be prosperous. What about a fresh start financial empire your choice. what about all the financial thieves that make the simple folks lives difficult a new established criminal court might be required can’t wait too find out who might be attending. Great idea but remember the “Golden Rule”. Those who have the gold rule! We should try the banksters and politicians and bureaucrats that keep flipping back and forth from government and industry. why dene do you want to rule the economy this is a legal matter get advice from a new government america. I live on the LORD God’s economy. Me too but it doesn’t pay the bills at the end of the month! Who gives a S***??? Maybe it’s better to start all over and we can start feeding the millions of children who are starving instead of a few assholes having TRILLIONS of dollars in bank accounts.And what for?They’re not going to take it with them wherever they go after this life!!!! Wish we could start over but we’d probably make a mess of it all over again…. Just need the players to make it happen save the economy before the total economy destructs that could take down the entire financial world materialism consumes. The players are when america puts in place a proper government that the people trust then could be saved. Absolutely ron the founder princple of barter and trade could help produce great people a new economic design stucture might help save a economy if produced from this knowledge design, as displayed we all could get rich in produce and wealthy. Strange sense with economic design presented this article it all most seems like a big deal with its self better have positive common good solutions opposition is always seeking to destroy what they do not understand or own or greedy or ignorant or cruel. I have been generous all my life when I see someone who has worked real hard and is down. They merit having help. Those who do not help are also demanding something for nothing. The fact that we are giving others a life that is not earned is a showing that we are on our last leg as a humanity. Sloth has never created a great people. Hard work is the key. Tough Love is my touchstone. Like I said above, this is a sign of things to come. Get ready for your little 8X8 cell. We are 7 million and will arrive at 9 million at the turn of the head. We will be eating each other before it is over. See the Chavin Culture (Peru). At the moment this might seem like a financial blitz like what has been reccomended system works best honestly productive nation give what you can we try very hard to do our best consider that show what are you going to consume plenty more arriving that know what needs to be done world economy whatever you reckon is yours be generous thats what is being asked. Get told it is bunked,so fine then take that then have plenty more with all due generous givings thank you again for the challenge getting wise about money has plenty rewards yep thats for sure on display what a honest days work dont suggest any lesser of me you will be found, just wait and see where they end up, have some more advise this is good that is why. Seven Billion of us are being sold a bill of goods at present. It is being done to burgeon the rise of the Gods. We can fight for our futures, but the fact remains that we have let Liberalism explore to destroy the Merit System once embraced by most people. Now, we have folks threatening to destroy our systems by rebelling against working. Giving them goodies will destroy the world in the end. It is a done deal. The wusses have taken over. They are our children. Something for nothing. This how it ends and it is very nasty. Get ready to fight for your life. This is not good. Evil had a plan and it was sloth gone astray. Dream on. Our dreams are turning into nightmares for some it is to late but if a nation rises up from the ashes the truth is just that we are at the stage where the final confrontation might occur why are the producers at w-m being monitored the innocent comments from awesome people are being played out from the NWO this dangerous government is closing in on us all displayed names can be accounted for just news for truth.